Prominent reformer in the London community; born at Portsea, England, Jan. 9, 1783; died in London Jan., 1848. At the age of twenty-one he emigrated to Barbados, where he plied his trade as a watchmaker. After a visit to England in 1810, he abandoned his occupation for that of a general merchant. In a few years he became one of the most opulent merchants in Barbados. Elkin then devoted himself to the improvement of the internal affairs of the Barbados congregation. 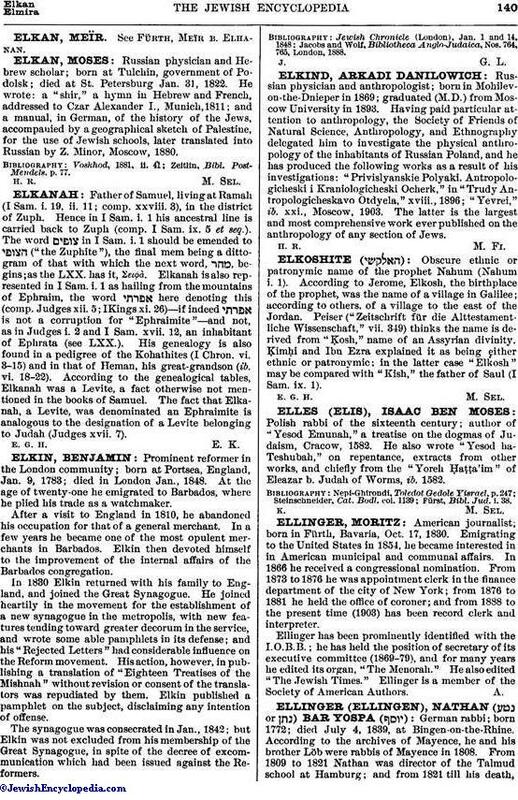 In 1830 Elkin returned with his family to England, and joined the Great Synagogue. He joined heartily in the movement for the establishment of a new synagogue in the metropolis, with new features tending toward greater decorum in the service, and wrote some able pamphlets in its defense; and his "Rejected Letters" had considerable influence on the Reform movement. His action, however, in publishing a translation of "Eighteen Treatises of the Mishnah" without revision or consent of the translators was repudiated by them. Elkin published a pamphlet on the subject, disclaiming any intention of offense. The synagogue was consecrated in Jan., 1842; but Elkin was not excluded from his membership of the Great Synagogue, in spite of the decree of excommunication which had been issued against the Reformers. Jacobs and Wolf, Bibliotheca Anglo-Judaica, Nos. 764, 765, London, 1888.